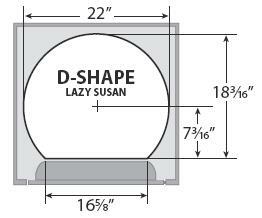 The new 22" D-Shaped Wood Lazy Susan also comes in a 5 shelf set designed for pantry/tall cabinet applications. These durable wood shelves are made from 5/8" thick high density multi-ply shelf with a 1" high solid wood rim and is UV-cured clear coat finish. The new wood storage trays are idea for any of your storage needs. The 14" and 20" width trays feature a sleek design constructed of beautiful maple with chrome accents. The door storage trays are easy to install on 26" and 58" standards with tray clips (sold separately).